These poems are about gardens, particularly the seventeenth-century French baroque gardens designed by the father of the form, André Le Nôtre. While the poems focus on such examples as Versailles, which Le Nôtre created for Louis XIV, they also explore the garden as metaphor. 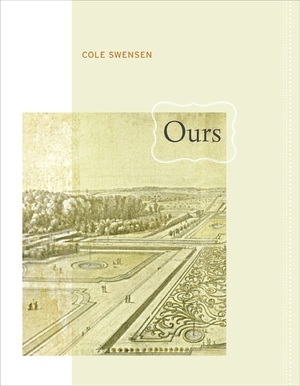 Using the imagery of the garden, Cole Swensen considers everything from human society to the formal structure of poetry. She looks in particular at the concept of public versus private property, asking who actually owns a garden? A gentle irony accompanies the question because in French, the phrase "le nôtre" means "ours." Whereas all of Le Nôtre's gardens were designed and built for the aristocracy, today most are public parks. Swensen probes the two senses of "le nôtre" to discover where they intersect, overlap, or blur. Cole Swensen is the author of eleven previous books of poetry. She is also a translator and has won the PEN USA Award in Literary Translation. Her poetry has won the Iowa Poetry Prize and the San Francisco State Poetry Center Book Award, and she teaches at the Iowa Writers' Workshop. "YOU ARE A HAPPY MAN, LE NÔTRE"